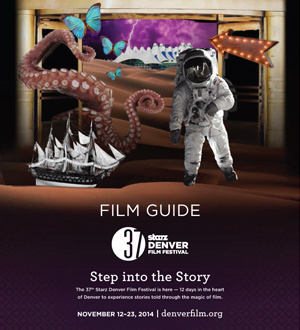 The Starz Denver Film Festival returns for 2014, and so does our coverage. We’ll post a new review just about every day; you can find the newest on our home page, on our SDFF37 sidebar, or on our Twitter feed @moviehabit. This year we will have reviews of at least 10 features that you can see at the festival. Some are titles you’re sure to see when awards season gets under full swing — like The Imitation Game starring Benedict Cumberbatch as Enigma-breaker and father of computing Alan Turing, or Two Days, One Night starring Marion Cotillard from the prolific Belgian directing team the Dardenne brothers. Still others are films you might not see anywhere else such as Kumiko, The Treasure Hunter, the unlikely true story of a Japanese woman looking for Steve Buscemi’s money hidden in the movie Fargo. Or Uncertain Terms, an American indie drama set at a home for pregnant girls with an outstanding performance by newcomer Adinah Dancyger. If you’ve attended DIFFs of the past you might remember director Mike Ott. Previous films he brought to Denver include Littlerock and Pearblossom Hwy. This year he brings Lake Los Angeles, a rich, dense, textured film about two immigrants to the United States. Ott’s low-budget roots still show with location settings and nonprofessional actors. It’s all in service to a strong story with well developed characters. Of the films I’ve seen, I think the most exciting ones to look for are director Bent Hamer’s 1001 Grams and Wild, based on the bestseller and starring Reese Witherspoon. Both have played at other festivals but still have yet to be released widely. My personal favorite is1001 Grams, a wry visual comedy from Norway that calls to mind the humor of Mr. Hulot and Mr. Bean. For the taste of another culture I am told there are a ton of Brazilian films, but I liked Of Men and Horses from a rural, equestrian corner of Iceland. For your nonfiction fix, An Honest Liar tells the story of The Amazing Randi, once an escape artist, then a debunker of charlatans, and finally an out member of the gay community. These titles only scratch the surface of what’s available, so download a festival guide, check your schedule, and get festing.